The common symptoms and signs of atrial septal defect are right axis deviation on the ECG,congestive heart failure, cardiac enlargement detected on the chest x ray, dilated right atrium on ECHO and left to right shunt through defect by color Doppler, widely split S2,systeolic ejection murmur and right heave. 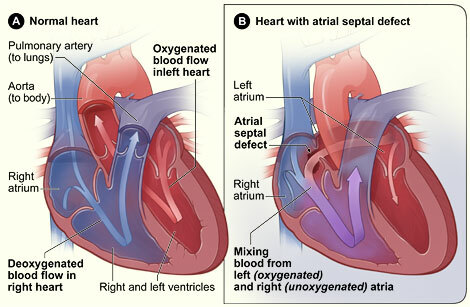 The complications of atrial septal defect are endocarditis and pulmonary hypertension. The treatments of atrial septal defect may include cardiac catheterization for closure of the small defect or surgery for large defect will right heart dilation.